In a large skillet over medium heat, saute chicken in olive oil until cooked through. Meanwhile mix everything needed for the taco seasoning in a small bowl. Add taco seasoning, beans, corn, salsa (I would recommend mild salsa, because the taco seasoning is pretty spicy, but if you are fan of very spicy you could put hot salsa) and a little water if needed to prevent drying out. Mix it good and cover. Let it simmer for about 10-15 min over low heat. Preheat oven to 350F (180C). 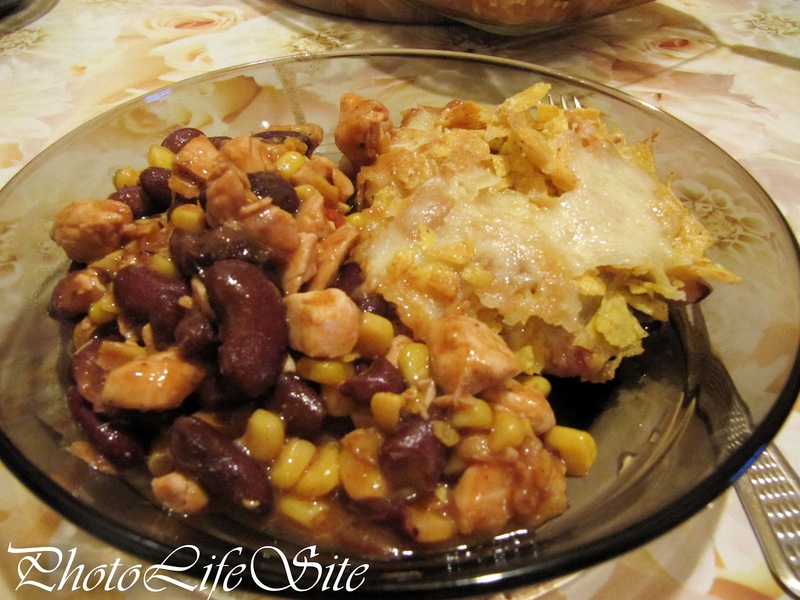 Transfer chicken mixture into a baking dish and top it with half of the shredded cheese and all the tortilla chips. Bake for about 15 min and add the remaining cheese and bake until cheese is melted and bubbly. Depending on how spicy you and your family like it, you could use as much or as little chili powder as you want! Oh yum that looks super tasty! This looks really good - I'm thinking it's something I could make on a Sunday and eat for work lunches during the week. Thanks for sharing! This isn't a tofu recipe! Why did you link it to a tofu recipe linkup??? This looks delicious! Love your taco seasoning mix! I pinned this to my recipes. Thanks so much for sharing at Toot Your Horn Tuesday. I look forward to seeing you next week :) Mexican food is my fav! Little Birdie Told Me…” Tuesday this past week! P.S. spotlighting your post on my Facebook page today!